2007 Aprilia ETV 1000 Caponord. Picture credits - Aprilia. Submit more pictures. The perfect embodiment of Aprilia�s Total Tourer concept, the Aprilia ETV 1000 CAPONORD faces 2007 as the pace setter in technology and performance. Fuel system: Injection. Integrated electronic engine management system. Indirect multi-point electronic fuel injection. 57 mm diameter throttle bodies. 10.3 litre airbox with Air Runner ram air intake. Frame type: Double Wave Twin Beam frame in aluminium-magnesium alloy. Front suspension: Marzocchi 50 mm hydraulic fork. Front brakes: Double disc. Bremo stainless steel semi-floating disks. Rear brakes: Single disc. Bremo stainless steel disk. Comments: Also availble with ABS. 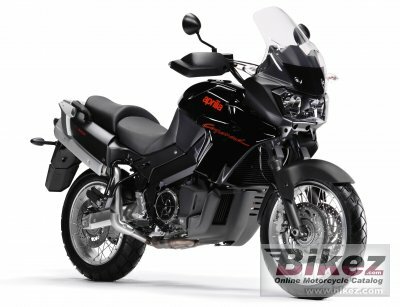 Ask questions Join the 07 Aprilia ETV 1000 Caponord discussion group or the general Aprilia discussion group. Get a list of related motorbikes before you buy this Aprilia. Inspect technical data. Look at photos. Read the riders' comments at the bike's discussion group. And check out the bike's reliability, repair costs, etc. Show any 2007 Aprilia ETV 1000 Caponord for sale on our Bikez.biz Motorcycle Classifieds. You can also sign up for e-mail notification when such bikes are advertised in the future. And advertise your old MC for sale. Our efficient ads are free. You are also welcome to read and submit motorcycle reviews.